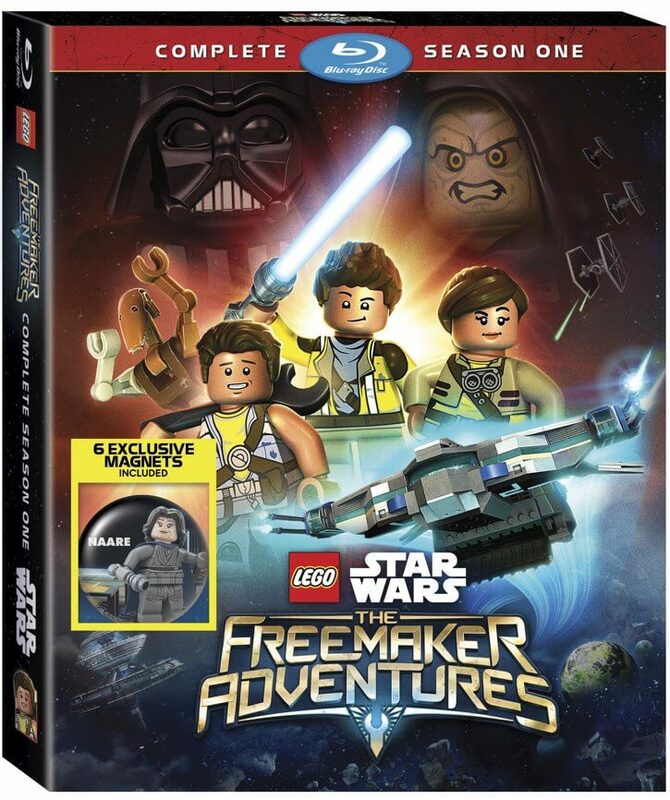 Star Wars LEGO Freemaker Adventures on Blu-ray! The Star Wars LEGO Freemaker Adventures series looks at a group of siblings that run a salvage operation inside of a space station known as the Wheel. The three siblings are Zander, Kordi and Rowan. They’re also joined by a battle droid named Roger who is seen better days since the Clone Wars. As expected, the battle droid is the comedic foil but it does work well as an ensemble cast. We also meet a lot of familiar faces, like the Emperor, Darth Vader and a few other Star Wars regulars. Season One of Star Wars LEGO Freemaker Adventures on Blu-ray! The 13 episode series takes off when Rowan discovers that he has the ability to sense a strange crystal on a salvage mission. Does this mean that Rowan has connections to the Force? It also pulls a Jedi character into their universe to help them find these crystals. Ultimately the Freemakers and the Jedi want to keep the crystals out of the Emperor’s hand. The lore behind this mystical Kyber Saber is an interesting addition to the Star Wars canon. The Star Wars LEGO Freemaker Adventures take place between The Empire Strikes Back and Return of the Jedi films. This gives the writers and producers plenty of jokes that they can use based on the beloved films. Just like the other LEGO films, there are jokes for every age. I have to admit that the scenes with the LEGO Emperor are fantastic, especially for fans that have memorized all of the iconic lines from the films. Just wait till you see the museum dedicated to the Emperor. Priceless! Just like the other LEGO Star Wars episodes and films, I really enjoyed this. I think it’s a great television show that children and adults can share as they enjoy and explore the Star Wars universe together. With all of the movies and toys, it’s nice to see a television show in the Star Wars universe that does focus on the family and the strength of being together. Plus, the Kyber Saber was pretty amazing. What do you think about Star Wars LEGO Freemaker Adventures? Rogue One Review (Spoiler Free): Hope!